If you are like the vast majority of drivers on the road today, you probably have a vehicle with an automatic transmission. While automatic transmissions are by no means new, they were originally developed to make driving easier. At any rate, automatic transmissions are quite complex and many drivers are guilty of using them incorrectly. As easy as it seems to simply shift them into and out of gear, many bad habits can ruin the automatic transmission! Once your automatic transmission is damaged, you’ll be visiting a salvage auto supply store for replacement parts to repair it. However, if you want to keep your automatic transmission in good working condition, check out the things you should never do! When is the last time you engaged the parking brake? If you cannot remember than you might be guilty of mistreating your vehicle. Placing the gear selector in “Park” engages a mechanism called the “Parking Pawl”, which is a small metal piece that locks the output shaft of the transmission. If you do not have your parking brake engaged, the parking pawl can break if your car is struck by another vehicle, which could send your vehicle into traffic and/or break the parking pawl. Even the lightest of bummer taps can damage the parking pawl if the parking brake isn’t engaged! If your parking pawl breaks, you’ll wind up with pieces of broken pawl in the transmission and that’ll cause serious damage. With that in mind, ALWAYS engage the parking brake when you are exiting the vehicle. Have you ever reversed out of a parking spot and then thrown the car in drive before it comes to a full stop? Or vice versa? If so, you need to stop that bad habit immediately. Shifting too quickly while your car is still in motion can cause significant damage in the transmission because there is a spinning coupling mechanism that can prematurely fail if it becomes worn from the harsh gear change. Always come to a complete stop before shifting into another gear. 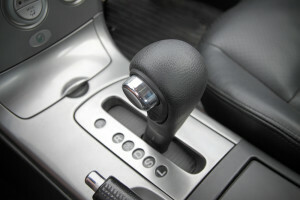 If you were taught to drive with a manual gearbox, you may have learned to downshift the transmission to slow the vehicle down while approaching a stop light or descending a hill. This practice is not acceptable in automatic transmissions because a forced downshift at high-engine RPMs can result in excessive transmission wear, specifically to the clutch friction plates and the transmission bands. When you need to come to a stop or slow down in an automatic vehicle, always apply pressure to the brake and leave the gear selector alone. It’s never a good idea to shift your vehicle into gear, whether from “Neutral” or “Park”, when the engine is idling fast. Shifting into “Drive” or “Reverse” can cause a sudden, jarring movement on the transmission which increases the stress on the transmission bands and clutch plates. Not only can this sudden movement jolt the entire transmission, but it can also cause damage to other drive line components. The increased idle speed may only last momentarily, so be patient and wait for the engine to drop the idle speed before shifting into gear. Be aware of these automatic transmission mishaps so you can avoid costly repair bills down the road!